There are plenty of good, honest carpet cleaners who go above and beyond to provide you with clean carpet and outstanding customer service. However, some have earned a less than favorable reputation for being “pushy” or “salesmen”. While most people are inherently good, you still need to protect yourself, your home and your family. Here are a few tips on how to choose a carpet cleaner you’ll be happy with. First, ask around. Find out who your friends, family and neighbors use to have their carpet cleaned. Ask about their experience and how they found their carpet cleaner. Just by asking, you’ll probably have 2 or 3 good leads – and 2 or 3 names to avoid. If you’re new to an area and don’t have many connections yet, you can always check with your local Better Business Bureau. They can let you know what businesses maintain a good rating, are licensed and how long they have been in business. The BBB can also let you know if a business has had any complaints. The internet is also a good resource for referrals. Google, Yelp and Facebook all have review sites for local businesses. Once you’ve found a few carpet cleaners to call, there are some basic questions you should ask. What type of carpet cleaning do you want or need? Carpet manufacturers typically recommend a hot water extraction (HWE), commonly called a STEAM CLEANING. 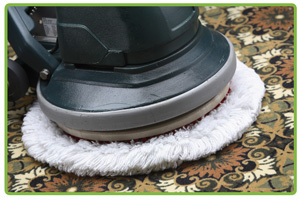 A Steam cleaning is the most common type of carpet cleaning, however, you have other choices. You may want to consider a shampoo, dry cleaning, encapsulation cleaning or a host dry cleaning. Only you can determine which cleaning is right for you and your home. Be sure to do some research on the type of carpet cleaning you choose. You’ll want to be certain that the cleaning doesn’t void your carpet warranty. Bonnet on the bottom of a rotary extractor used in Dry Carpet Cleaning. Ask about pricing. Do they charge by the square foot for carpet cleaning? Or do they charge by the room? When you pay for carpet cleaning by the square foot, you typically pay for the areas you have cleaned, like traffic areas. If your cleaner charges by the room, make sure you ask if there is a maximum room size. Large rooms can often count as 2 or 3 rooms. It’s always better to ask questions before than to be surprised or over-charged later. Are your carpets in bad shape? If your carpet is heavily soiled or does it have pet stains? Be sure to mention the condition before hand. Some carpet cleaners charge extra for heavily soiled areas and some do not. Most carpet cleaners do charge extra for pet urine removal so be sure to mention any pet urine that you’re aware of. What type of guarantee does the carpet cleaner have? A reputable cleaner typically offers some type of guarantee if you’re not satisfied with their work. Most carpet cleaners offer to return at no charge if you have a spot or two resurface within a week or so. Be sure to ask about the re-service policy. Who will be in your home? Another thing to keep in mind is the actual carpet cleaner who will be in your home. Has your carpet cleaner been background screened or drug tested? You probably want to avoid a company who sends a sub-contractor to perform the work. What about the quality of the cleaning products being used? Are they high quality and safe for the environment or cheap and ineffective? Finally, remember that not all carpet cleaners are created equal and their pricing will reflect that. Just like a pair of shoes – you often get what you pay for. If you’re looking for a quality carpet cleaning, just follow this basic advice as you choose a carpet cleaner. You’ll be glad you did your research!